Substitute products offer consumers variety when making purchase decisions by providing equally good alternatives, thus increasing utility. However, from a company’s perspective, substitute products create a rivalry. As a result, businesses may incur high marketing and promotional costs5 P's of MarketingThe 5 P's of Marketing – Product, Price, Promotion, Place, and People – are key marketing elements used to position a business strategically. The 5 P's of Marketing, also known as the marketing mix, are variables that managers and owners control to satisfy customers in their target market, add value to their business, when competing for market shareMarket PositioningMarket Positioning refers to the ability to influence consumer perception regarding a brand or product relative to competitors. The objective of market, which, in turn, reduces operating profitsOperating IncomeOperating Income, also referred to as operating profit or Earnings Before Interest & Taxes (EBIT), is the amount of revenue left after deducting operational direct and indirect costs. Interest expense, interest income, and other non-operational revenue sources are not considered in computing operating income. Some companies are even put out of business due to substitute products significantly outperforming their own offerings. Every business face some form of competition, even monopolyMonopolyA monopoly is a market with a single seller (called the monopolist) but many buyers. In a perfectly competitive market, with a large number of sellers and industries. Most of the competition comes from substitute products. A substitute product is one that serves the same purpose as another product in the market. Getting more of one commodity allows a consumer to demand less of the other product. The demand for substitute products shows a negative correlation. That is, consumption of one product reduces or replaces the need for the other. For example, if you are moving from point A to B, you can only use a car, bicycle or another mode of transportation. However, the demand and pricing of substitute products exhibit a positive correlation. It means if the price of one product increases, the demand for the other increases. For example, coffee can be said to be a substitute for tea, and solar energy is a substitute for electricity. If the price of coffee goes up, the demand for tea goes up too and vice versa. 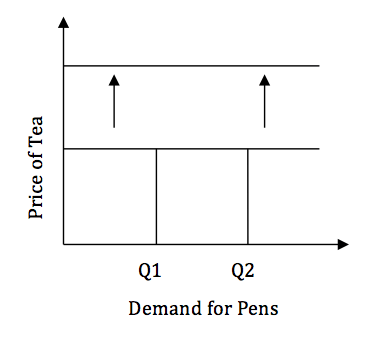 From the graph above, if the price of coffee increases, there is a correspondent increase in the demand for tea from Q1 to Q2. It will only apply if we assume that the price of tea remains constant. It is unlikely to see a person drinking coffee and tea at the same time. However, it is not hard to find an entity that uses both solar energy and electricity. Since every producer of the substitute product is trying to sell more and the only things they can rely on are branding and pricing. Thus, the prices of products with many substitutes are highly volatile. In a market where there are fewer substitute products, there is a probability of earning higher profits. The availability of more products can lead to a higher utility. No one single product can satisfy all consumers of a particular type of products. Therefore, the greater the number of substitutes, the higher the probability of every consumer getting what is right for them. The greater the number of substitute products in the market, the more rivalry exists in the industry. When the competition becomes intense, there are imminent risk-associated controls. In a bid to be the lowest seller in the market, companies try to use the least amount of resources in their manufacturing process to reduce costs. However, it works against the welfare of the consumer and leads to the production of low-quality products. Switching cost is the loss or the extra cost you incur from leaving the option you were using before. For example, if you have been taking notes with a pen but now you want to take them using a video recording device, the switching cost here is high since you will have to buy the video recording device. As a result, you are likely to stick with the notebook and a pen. On the same note, you can switch from one pen to the other easily since the switching costs are low. If a product is priced fairly, for example in the case of writing pens, there is a higher risk of consumers switching from using one pen to the other unless they are loyal to the particular brand they have been using. If substitute products are highly differentiated and are of high quality, a consumer is likely to switch to a product that offers better quality. For example, users of aesthetic products like skin lightening creams are very sensitive to quality. They will discontinue using a product once they realize there is a higher quality substitute in the market. If two substitute products perform differently when subjected to various conditions, the customer will choose the option that is most convenient for the particular prevailing condition. For example, in the transport sector, while traveling for shorter distances, most people prefer small vehicles. On the other hand, while traveling for long distances, commuters may prefer big buses and train. Many reasons may contribute to this, but it is mostly due to comfort. 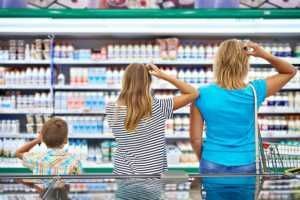 If substitute products are readily available in all corners of the market, there is a likelihood of consumers switching more often. If the price of one product rises, the demand for the other product rises since consumers will prefer to pay a lower price if the utility derived is almost the same. If the change in price causes a significant change in quantity demanded, the product is said to be elastic. If the change in price causes a small change in demand, it is called inelastic demandInelastic DemandInelastic demand exists when the consumer’s demand does not change as much as the price. Inelastic demand often affects commodities and staple goods..
For example, if the price of coffee goes up, most consumers will switch to tea unless those customers are loyal to coffee and consume it for other reasons. Demand elasticity is how sensitive the demand for a good is to the change in other economic variables like price and consumer income. Two goods that are substitutes show a positive cross elasticity. It means that as the price of product x rises, the demand for the other product rises. 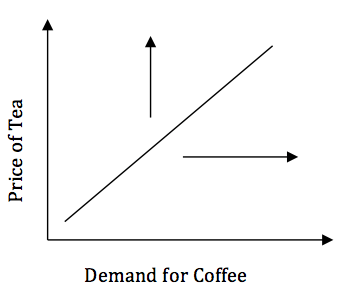 As seen in the graph above, when the price of tea increases, quantity demand of coffee also increases. Two goods that complement each other exhibit negative cross elasticity. The increase in the price of one product causes a drop in the quantity demanded of the other product. For example, if pens are very expensive, people will opt to use ballpoints. 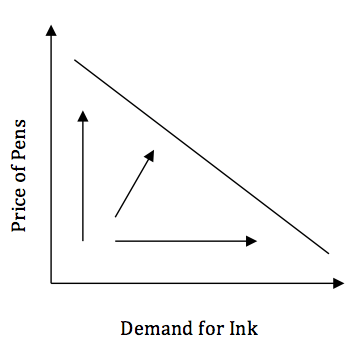 As a result, the demand for ink will drop drastically. Two goods that are neither complementary nor substitute and are independent of each other show zero cross elasticity. The change in the price of one product does not affect the other product pricing, and it remains constant. If a product can be substituted with another, it is called perfect substitute, for example, the different brands of bread can be said to be perfect substitutes. If a person buys one type, he/she is likely not to buy another bread product. Imperfect substitute products are the ones that although they can be replaced/substituted with each other, there is a probability there are those who will stick to the other product regardless of other factors. For example, bread and cakes can be said to be substitutes, but they are imperfect since some consumers will buy bread, but still want cake additionally. The benefit of substitute products is that provides consumers variety when choosing goods to satisfy their needs. On the other hand, companies will incur more costs to develop competitive offerings and promote them as the best in the market. Since there are always new entrants and the market might not be growing at the same pace, there are risks of obsolete stock even for the bestsellers in the market. Thus, the market needs to be regulated to prevent it from becoming flooded with too many products. Bargain PurchaseBargain PurchaseA bargain purchase refers to a transaction where the acquirer of an enterprise gets a good bargain far lower than the fair market value of the enterprise. In this kind of transaction, businesses are sold mainly due to a crisis.